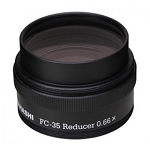 The ideal design for a reducer is its ability to reduce the f-stop while flattening the field and controlling chromatic aberration. 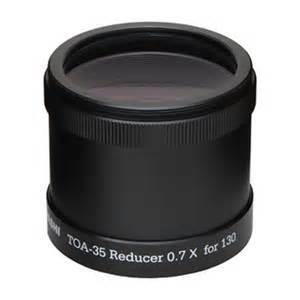 The TOA-35 0.7x reducer is configured with 4-elements in three groups and uses two low dispersion, high refractive index glass , while reducing the focal length by a factor of 30%. 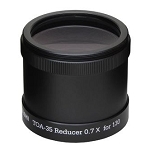 The TOA-35 reducer produces 3-micron stars in the center of the field and 6-micron stars at the edge with a very flat field. 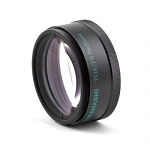 There is also an improvement in the color correction when used with the TOA-130/150. This high performance optical system produces images that will be flat, sharp and highly corrected for color. 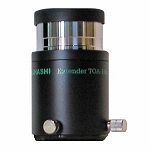 When used with the TSA Series the image is 8-microns in the center and 12-microns at the edge. 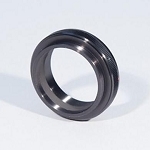 The TOA-35 Reducer is available in two models: the 130 model is designed to work with the TOA-130 and the 150 model is designed to work with the TOA-150, the TSA-120 and TSA-102. 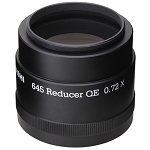 Each model is supplied as a set that includes the reducer and a wide mount Ø55mm adapter to attach the reducer to the camera that is used.